Home /Blog/Healthcare and Life Sciences outlook 2019: Is the heat still on? The year 2018 started with a bang and a positive outlook on healthcare and life sciences sector. While in US, the S&P 500 Healthcare index outperformed to add nearly 5 per cent versus 6.23 per cent fall in broader S&P 500 in 2018. Closer home, BSE Healthcare Index underperformed losing 6 per cent versus 6 per cent gains on Sensex during the year. These are just broader market indices and public market indicators of investment activity in healthcare and life sciences sector. The other side of the coin has private markets. The activity there remained subdued in terms of number of deals and investments in Q3FY18. This is because older post Lehman Era vintage is still looking for exits. So what is the outlook for 2019? 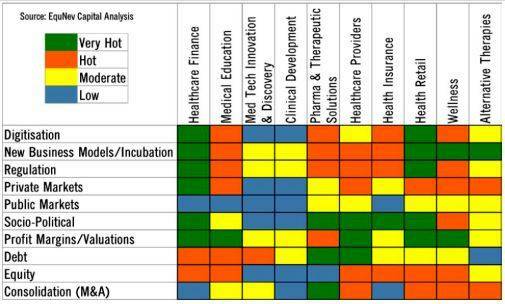 Our investment heatmap for 2019 shows a much cautious mood across the healthcare and life sciences sub-sectors with opportunities in some hot spaces. Is the heat still on in 2019? As compared to the 2018 heatmap, the heatmap for 2019 has some fire being doused by caution due to what transpired in 2018. When compared to the heatmap of 2018, the 2019 map still has some areas that will continue to remain hot for the sector on a selective basis. The first half of 2019 will see the political heat of the general elections in India leading to the uncertainty around investment in the sector. Largely, 2019 will be positive socio-politically but may cause some dent on the margins and valuations of the sector. Medical cost inflation after the rupee devaluation in 2018 and emerging price controls on procedures and implants will continue to be in the range of 20 per cent to 24 per cent in 2019. As the ‘India Stack’ builds up to bring the next 500 million into its fold, the consumer financing of healthcare events will still attract many operators leveraging fintech tools. Innovation into financing products and services for consumer financing of healthcare will see a few more players emerge. Incumbents of the likes of Bajaj Finserv will expect to increase the coverage throughout India in 2019. However, subvention will be under pressure from the healthcare operators due to margin pressures. The regulatory regime to open up different skills for healthcare has been playing catch up. The recent regulatory reforms that started will not see much action on the ground in 2019. The new age digital medium to skill in bulk is still balked by the respective skill councils and regulators. Don’t expect a single medical center of excellence on ground in 2019 in any state from the policy announced. Many of the debt servicing issues of the sector will still persist in 2019 with a few NCLT/bankruptcy cases coming up. M&A activity may heat up from here. The pipeline for moving into clinical development in 2019 is very negligible. Various initiatives over the last 4 years under various schemes to build the innovation pipeline have not resulted in serious players being recognised to take on global scale. We will see 5 IP either going through attrition or being a global scale innovation from India. On the clinical development front, the sector has maintained status quo since 2018. Investments will be muted. Story of 2018 to continue. Expect M&A consolidation activity. No mega stories expected in 2019. Although growth may pick up further post GST issues are sorted, markets to remain bearish on the sector. Election year populism may kick in a few more price controls in India. Digitisation will be a key driver in 2019. The hectic policy actions on all fronts in 2018 will result in some consolidation in the sector on account of margin pressure due to price controls and heady valuation expectations on exits. Expect only one major blockbuster IPO in 2019. Funding crisis to continue. Expectations of a few innovative delivery models to emerge as costs build up and prices will remain under pressure. Surprise could be in store in terms of further regulatory changes. Expectations of Rs 50000 million being further invested will be reviewed post Q3. Expect to see some innovative models for healthcare payers emerge in India for the middle bulge of India Stack for the middle 500 million that are paying out of pocket. As loss ratios mount, insurance rate will go northwards. Innovative products and pricing still a distant reality with the regulator in India. India will still not get its first unicorn in healthcare in 2019 as many of the series B and C players will fail to reach profitability. Valuations will be a key issue. Consolidation and acquisitions expected for some to survive and grow. Expect two very large PE funded players to close shop or merge. Regulatory puzzles of 2018 will not be solved till Q4 2019. Digital business models will be the key drivers for private and VC investments. Expect the investment buoyancy from 2018 to continue. No major blockbuster IPOs expected in 2019 from this sector. We may see newer business models emerge as tourism and wellness merge. Digital wellness is yet to prove itself in 2019. Who comes to power in the centre will decide what happens to Yoga after 2019. The Babas promoting alternative therapies will continue their journey northbound in 2019 as well. However, unlike Chinese alternative therapies, the Indian alternative therapies will still not gain global mainstream in 2019.